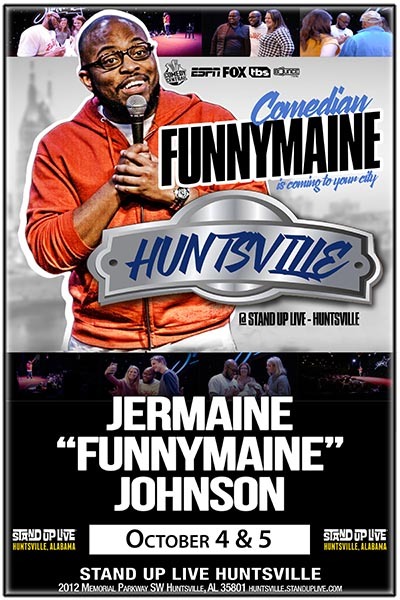 Jermaine Funnymaine Johnson: Jermaine "FunnyMaine" Johnson is a professional comedian, radio personality & internet superstar from Birmingham, AL. Johnson is a lifelong of the Alabama Crimson Tide and his "How Bama Fans" videos on Facebook and youtube have taken the southeast by storm averaging over 1.5 million viewers per week! He is a self-professed "country boy" who loves to fish, hunt and hike when the schedule permits but he also has a strong love for inside activities as an artsy web and graphic designer. Johnson plays piano, drums and was the drum major of his college marching band. The son of an Alabama pastor, he grew up learning to love and do for others around him as seen through his work with area youth and the Lupus Foundation of America. His talent and personality have allowed him to share stages with Steve Harvey, Kevin Hart, Rickey Smiley, DL Hughley and a host of other celebrities. Jermaine "FunnyMaine" Johnson is one of America's rising comedy stars and his live performances are clean and always receive high marks of approval from the audience!